If you’re still reeling from Friday’s poignant reveal of the new Star Trek Beyond trailer – aligned nicely with the franchise’s 50th anniversary celebrations – Paramount has premiered a series of screenshots from the sizzle reel, offering up a play-by-play breakdown of all the galactic action therein. Opening with a shot of Chris Pine’s Captain Kirk marinating over his place in Star Fleet – along with his ability to step out of his father’s shadow – with Leonard McCoy (Karl Urban), it isn’t long before Beyond‘s new trailer rolls out the stunning CGI set-pieces. But whereas ardent Trekkies took umbrage with the sequel’s first trailer, which appeared to lean heavily on Justin Lin’s (Fast and Furious) action sensibilities, there’s much more gravitas to each scene, as the scattered USS Enterprise crew find themselves in the clutches of Krall, a “complex and groundbreaking” menace that wants nothing more but to tear apart the Enterprise and everything it stands for. Donning heavy prosthetics for the role is Luther stalwart Idris Elba, who impresses as the film’s big bad even from his brief scenes littered throughout the trailer. One thing’s for sure: the Enterprise crew will be up against it in little under a month’s time. 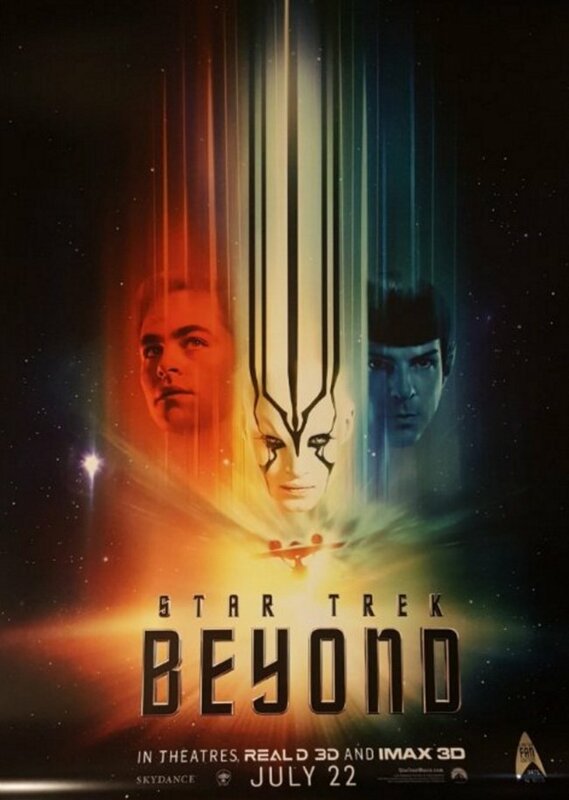 Also starring Simon Pegg, Zachary Quinto, Zoe Saldana, John Cho and Anton Yelchin, Star Trek Beyond opens on July 22. For now, you can have a gander at an all-new fan-made poster that surfaced from last weekend’s fan event.